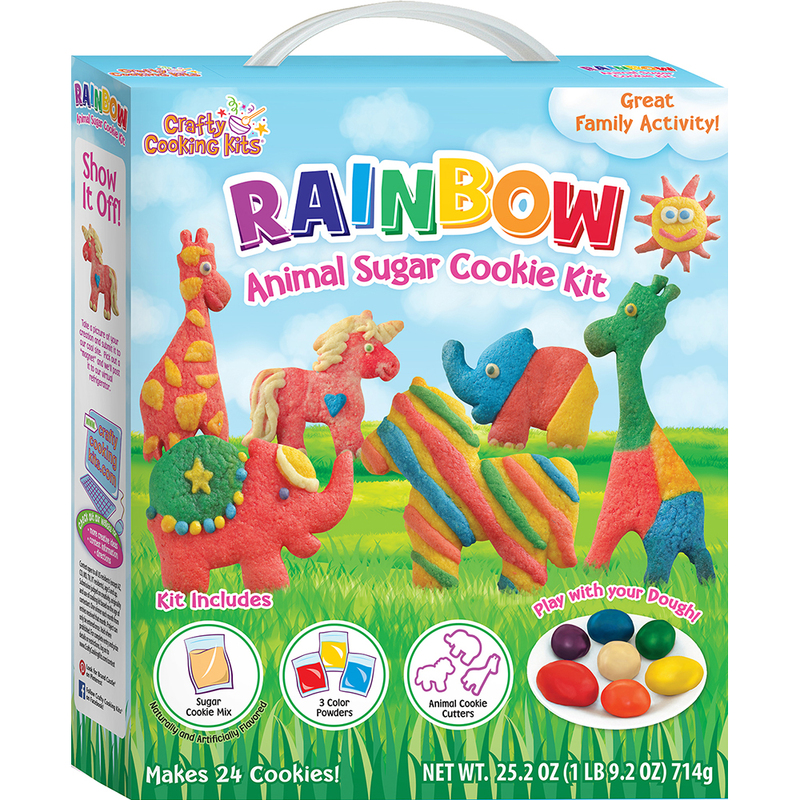 Create your own colorful animal-shaped cookies with this adorable kit! 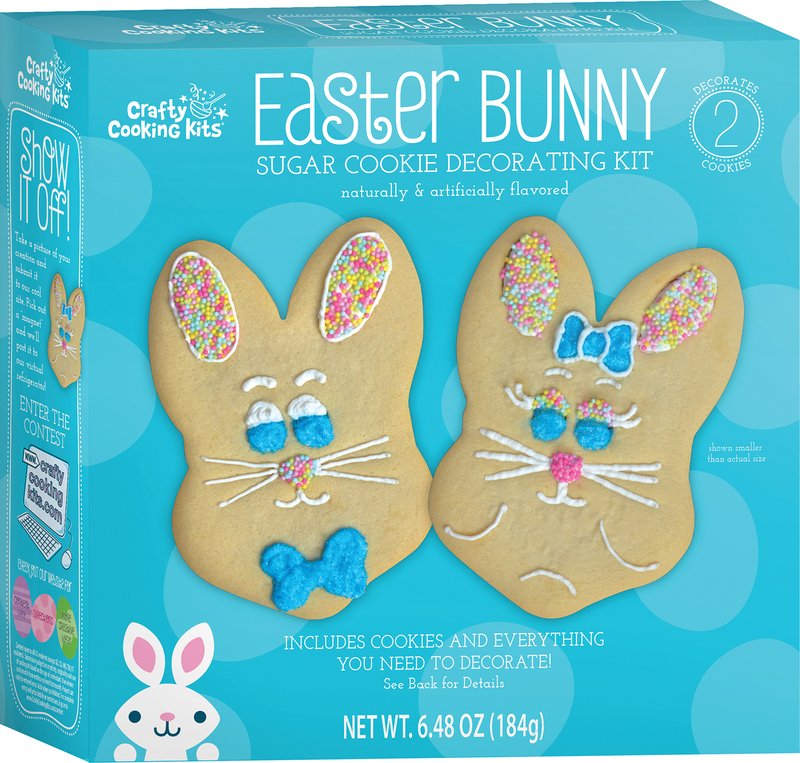 Featuring sweet sugar cookie mix and festive color powders, the dough is easy to shape and bake. 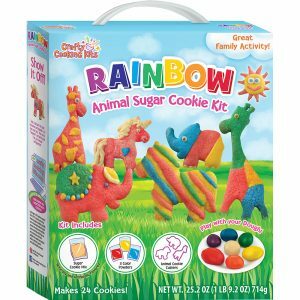 Sugar Cookie Mix: Enriched Wheat Flour (Wheat Flour, Malted Barley Flour, Niacin, Reduced Iron, Thiamine Mononitrate, Riboflavin, Folic Acid), Sugar, Natural And Artificial Flavors, Baking Powder (Sodium Acid Pyrophosphate, Sodium Bicarbonate, Corn Starch, Monocalcium Phosphate), Sodium Bicarbonate, Salt. Color Powders: Dextrose, Water, Red 40 Lake, Blue 1 Lake, Yellow 5 Lake, Yellow 6 Lake. Adults: Grease baking sheet with cooking spray, or use silicone liners. Wash cutters in warm, soapy water and dry thoroughly. Kids: Combine cookie mix, butter and eggs in large mixing bowl. Mix until well combined. Form dough into a ball and place on floured surface. Kids: Divide dough evenly into four parts. Three parts will become primary colors and one will remain plain. 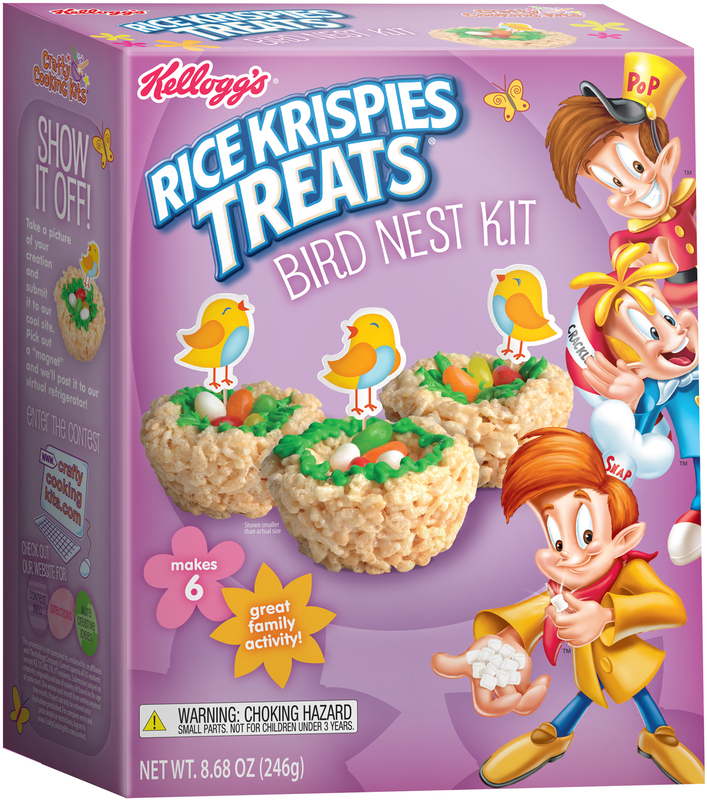 Form a well in center of one dough ball and place into a mixing bowl. Empty one color powder into well. Use hands to knead color evenly into dough until color is vivid. Place colored dough onto floured surface. Wash hands and bowl to remove any color before repeating process with remaining color powders and dough. To make secondary colors, combine two primary colors (see color chart) and work dough for a few minutes until color is vivid. To lighten colors, add plain dough to primary or secondary colors. Chill dough in refrigerator 5 to 7 minutes to make rolling easier. Kids: Place dough onto lightly floured surface and turn to coat both sides. Roll dough to 1/4 inch thick and cut shapes with included cutters, gathering and rerolling dough as needed but returning colored scraps back to their proper color piles. HINT: Dough will warm with repeated playing. If dough becomes sticky, place in refrigerator for 10 minutes and flour rolling pin and dough liberally. Press contrasting colored dough onto cookies to create fun designs. 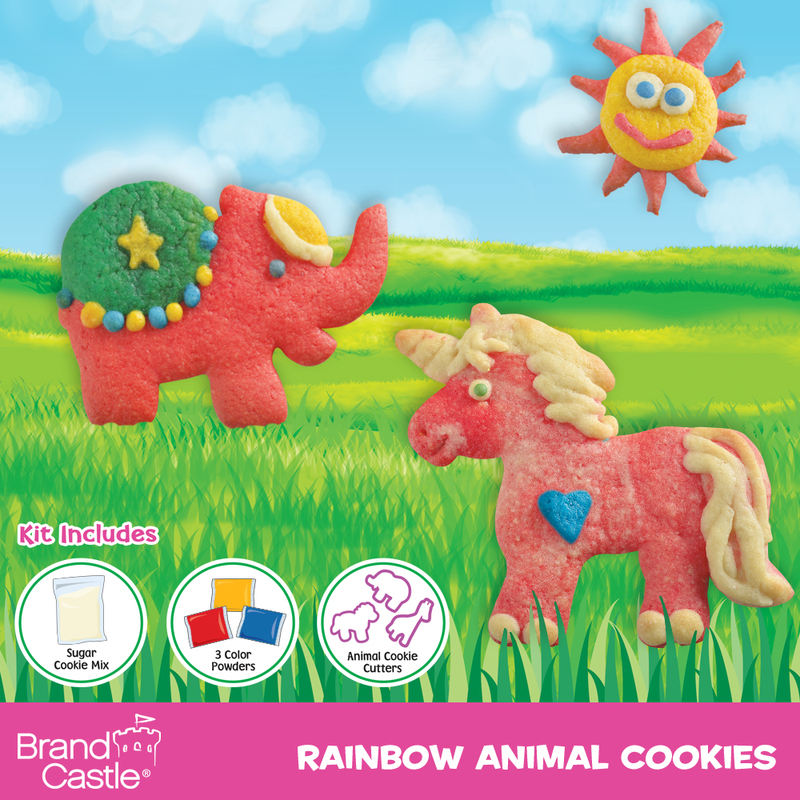 HINT: Another way to achieve a multicolored animal is to cut 2 of the same animal out of two colors of dough. Cut off portions of each animal and press contrasting pieces next to each other on cookie sheet. 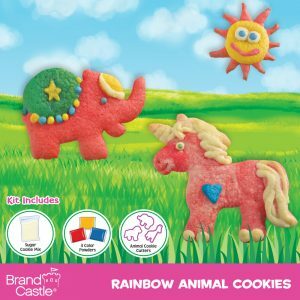 Adults: Place cookies 2 inches apart on prepared baking sheet and chill in the refrigerator while oven preheats to help cookies retain their shapes. Adults: Preheat conventional oven to 350F. Bake for 10 to 14 minutes. 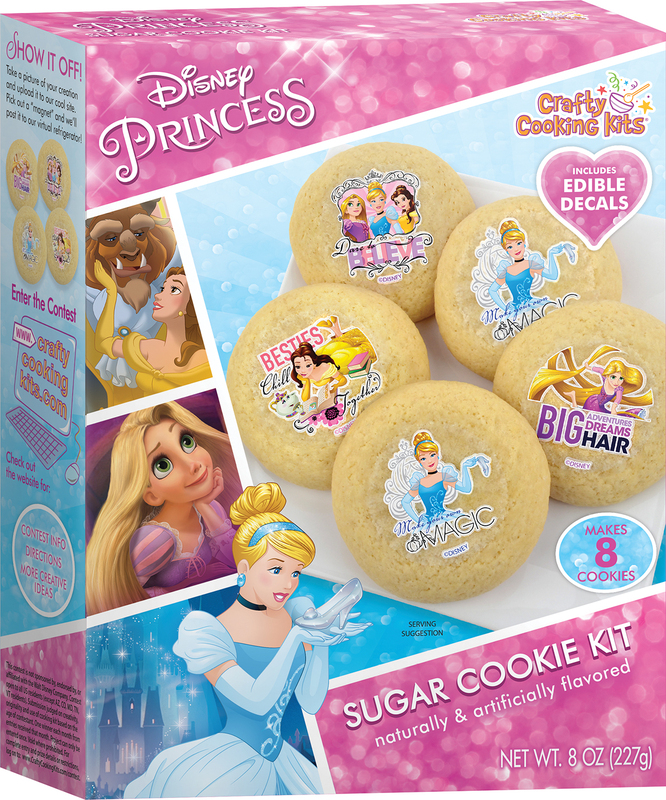 Baking time will vary depending on thickness of cookies – be sure to monitor cookies while baking and remove when edges are slightly golden. HINT: Cookie colors darken as they bake; do not over bake. Allow to cool for 1 minute on baking sheet, then move cookies to rack and cool completely. Place on serving platter and enjoy! Make secondary colors from your primary colors. *Toothpicks help create texture, such as hair or fur. *Twist ropes of colored dough together before rolling out to create tie-dye effect.